The lens is generally the most expensive and least understood part of any camera. 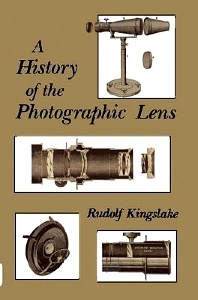 In this book, Rudolf Kingslake traces the historical development of the various types of lenses from Daguerre's invention of photography in 1839 through lenses commonly used today. From an early lens still being manufactured for use in low-cost cameras to designs made possible through such innovations as lens coating, rare-earth glasses, and computer aided lens design and testing, the author details each major advance in design and fabrication. The book explains how and why each new lens type was developed, and why most of them have since been abandoned. This authoritative history of lens technology also includes brief biographies of several outstanding lens designers and manufacturers of the past. Optical engineers and scientists with an interest in history, camera collectors, and photographers. Introduction. Meniscus Landscape Lenses. Portrait Lenses. Early Double Objectives. Optical Glass. The First Anastigmats. The Triplet Lens and its Modifications. Meniscus Anastigmats. Telephoto Lenses. Reversed Telephoto Lenses. Varifocal and Zoom Lenses. Catadioptric (Mirror) Systems. Lens Attachments. Brief Biographies. Appendix. A Glossary of Optical Terms.